1 mile LED compact lantern is designed to be maintenance-free. The unit uses 4 ultra-high intensity LEDs as a light source, and is made entirely from tough U.V. stabilized poly carbonate, making it ideal for aquaculture, hazard & perimeter marking, or transport/railway use. 2 miles LED are the most advanced and versatile compact marine lanterns available. Both have over 250 flash characters, adjustable on site by the user. The units also boast a completely sealed battery compartment, which enables the battery to be changed after years of service. installation. Typical applications include day and night channel, speed zone and restricted area marking. The POSEIDON Bouy is manufactured from UV stabilized polyethylene, has been specifically designed to withstand the harsh marine environment, and boasts a huge 23mm wall thickness - making it one of the toughest polyethylene buoys on the market. The buoy has a 2.5 meter focal height (up to 3 meters with extension), and a 1.75 meter diameter. 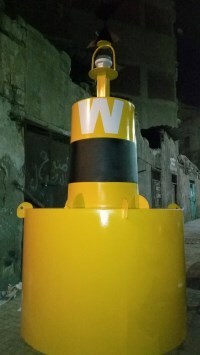 This Navigation Buoy has proven its superior performance for long range river and sea navigation. The base is molded in one-piece strong, durable polyethylene filled with highly buoyant polyurethane and U.V. stabilized for resistance to sunlight. The strong, lightweight polyethylene buoy top is molded in standard IALA colors and shapes. Suitable for mounting Sealite LED lanterns as well as recommended IALA Day Marks.